As beach season is upon us it is important to know how to avoid coming face to face with a shark. Even if you swim as fast as you can back to shore, a shark that thinks you are a “shark biscuit” and means to eat you, will keep coming! Approximately 85% of Australians live within 50km of the coast, and our beach-loving culture means we should be aware of safety measures when faced with a shark attack. 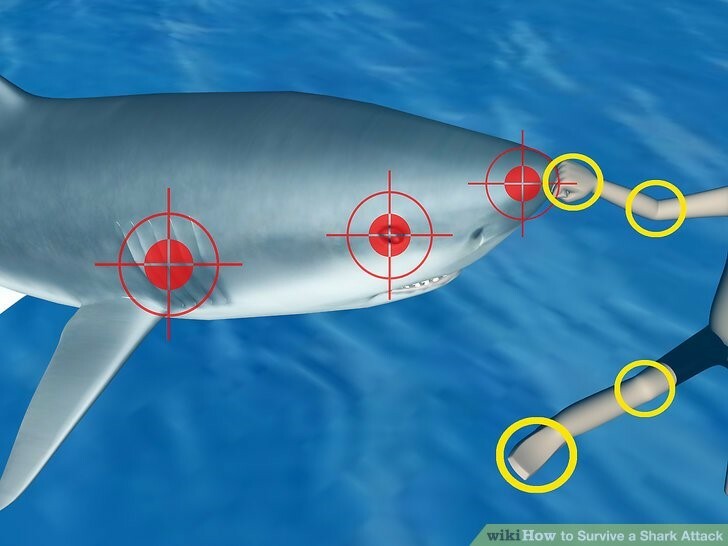 Shark repellents and shark nets are not fool-proof and as more people enter the aquatic environment it is inevitable that more encounters with sharks will occur. As humans we fear predators and a shark is one of the top predators of the marine world, so when entering their ecosystem you need to be aware how to minimise the risk of encountering an attack. Coastal areas where sharks have recently been sighted will post warnings, so you can avoid danger zones. Ask local people as they may be aware of potential dangers. Avoiding waters where sharks live or commonly gather in groups, will mean you do not have to tempt fate. Three species the white, tiger and bull sharks are responsible for the vast majority of human fatalities. But any shark over 6 feet in length could be potentially dangerous. Sharks are top predators and almost invincible in the sea. They are also blessed with many attributes, including outstanding senses of smell, hearing and sight, as well as the ability to detect minute changes in water pressure and electromagnetic fields. Sharks are creatures of habit. Do not swim in areas where a shark attack has recently occurred, since the same shark, or others may frequently visit the spot. So despite of how epic the waves are on that beach, go to another part of the ocean! To lower the likelihood of a shark attack one of the simplest tactics is to find safety in numbers, as sharks most often attack lone individuals. So whether you are surfing, swimming or diving your chances of a shark attack rises if you wander away from other individuals. To ensure help is nearby, stay near the shore and within sight of a lifeguard. Pay attention not to become isolated in the water, if one member of the group is attacked, then help is immediately available. Stay near the shore in groups; when too far from the shore, there are steep drop offs, sandbars and channel openings where fish hang and so do predator sharks. Between the flags of a patrolled beach is the safest spot to swim. The surf life savers are there to keep an eye on your safety, to look for signs of danger and to assist if you get into trouble. 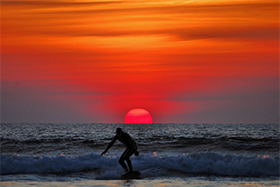 Night, dusk or dawn can be scenic times at the beach and it is typically less crowded and cooler. Yet with the beauty of the sun rising or setting over the ocean, the odds on encountering a shark rise, as these are typically the feeding times for many sharks.The lack of visibility from the dark makes it even more difficult for you to see the shark and they are better able to find you than you to see them. So even though our attraction for the night and twilight is shared by sharks for different reason, staying on land from dawn to dusk is the safest option. Sharks are attracted to bright, contrasting colour so whether it is a wetsuit, bikini, board short or rash guard, leave them at home. Try to wear bland, darker dull colours. Avoid wearing bright colours such as yellow and orange and anything flesh-coloured, including white or high contrast. Even the contrast of an uneven tan can attract sharks as it resembles the colour variations on fish. Sharks do not see in colour, but in shades of black and white. Sharks are more attracted to people paddling on a surfboard, as the detail of the arms and legs have been hidden and the surfboard shape could be mistaken for a turtle, seal or sea lion, a shark’s natural prey. Illuminating the bottom of surfboards with lights could help to deter sharks. Earrings, necklaces, rings, watches, bracelets and anklets can all be hazardous to swimmers and surfers. They reflect the light and look like the scales of fish flashing in the water, and hence shark food. The flashing light of jewellery or even shiny swimwear, going in and out of the water catch the shark’s attention. So leave shiny jewellery or similar accessories at home or save your flashy gear for terrestrial pursuits! 6. Avoid erratic movements and splashing. When people see a shark they freak out, frantically splashing as they scramble back to shore. Wild movements draw sharks towards them as they think it is a wounded animal. 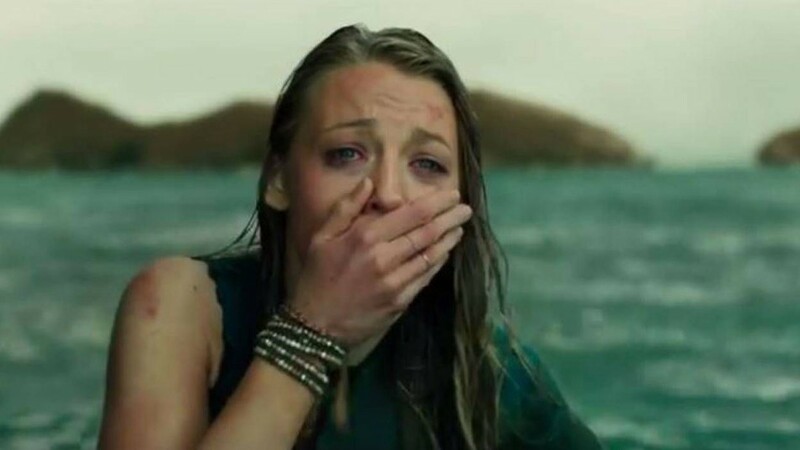 The rapid splashing may even attract more sharks closer as they become even more intrigued, increasing their tendency to bite. Resisting the urge to panic and splashing violently as you try and escape, can be difficult. Yet a limp body will look less like a prey in distress. Of course it is usually fine to splash at the beach, but excessive splashing is more risky, if you are in not on a patrolled beach and away from the flags. 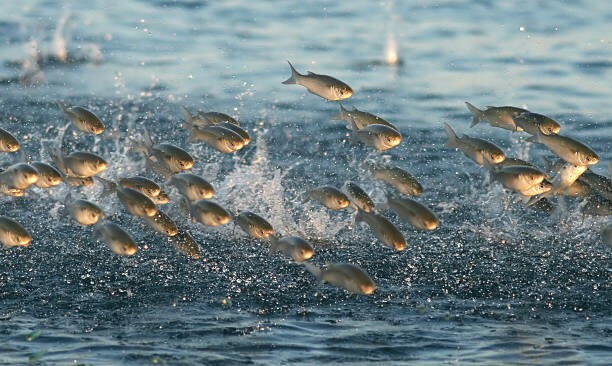 If there are other lures for the sharks like schools of fish or baitfish, it is best to splash as little as possible. Also, keep your pets out of the water as the splash of a dog padding is like a dinner bell for sharks! As a surfer or swimmer, if in trouble, staying vertical in deeper water prevents you looking like a seal as in a horizontal position there is a visual similarity between surfers and seals. Luckily since sharks are usually put off by the boniness of our bodies and the fiberglass of a surfboard, most of the time sharks do not come back for another bite! 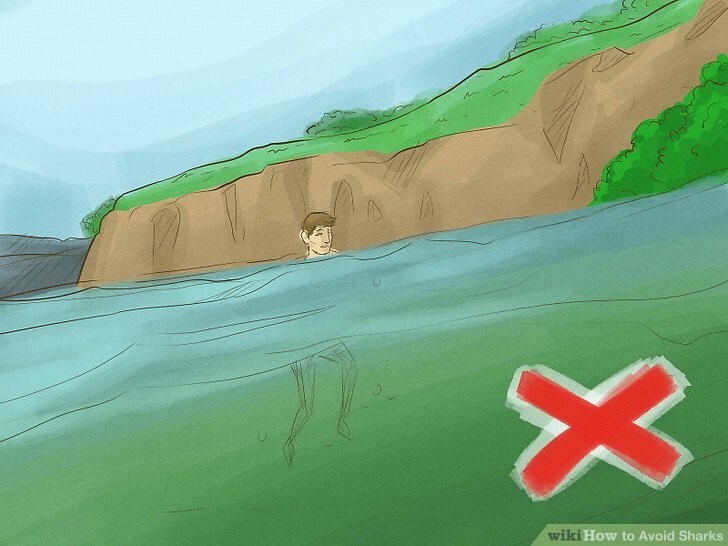 If you have an exposed wound or bleeding cut, do not swim in open water. Blood and human waste attracts sharks. In fact, sharks can smell and taste blood from more than a mile away, so if you get injured it is critical you get out of the water as quickly as possible and stop the bleeding. Sharks do not aimlessly chase blood, their senses are sharp enough to detect specific amino acids in blood in concentrations up to one part per million. So they can smell or taste these tiny traces of blood from more than a mile away and then track the scent back to the source. Urine is a sign of distress in some sea animals and as the same amino acids are in urine and sweat, no peeing in the water! 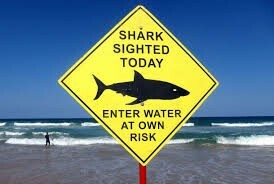 Water conditions can limit both the your and the sharks visibility. Sharks do not have a good sense of sight so the low visibility will make it more difficult for them to determine whether you are fish or human. However, sharks have many ways of finding their prey, including organs which sense bioelectric fields, so even in murky water they need not rely on their sight to differentiate a meal. These powerful senses can lead them to prey even when it is hard for them to see. Humans lack these senses so are much more likely to be taken by surprise by sharks in low visibility water. Be aware of entering the water after a storm or heavy rainfall, because this stirs up the water and causes it to be murky. It is also wise to skip swimming after heavy rains as it may move some sharks into areas they would not otherwise occupy. Also in shark-prone areas try to avoid overcast days, as it approximates the light levels at dawn and dusk’s feeding times. Sharks are more likely to be where easy sources of food are prevalent. So to keep your chances of encountering a shark to a minimum, keep far away from shark food sources. This may also mean paying attention to fish swimming patterns. If large schools of fish start to jump or dart away, chances are there are potential predator sharks lurking underneath. Flocks of diving sea birds are a good indicator that there is food in the seawater. Anglers and fishing boats can also attract sharks which are looking for an easy seafood snack. Areas with commercial fishing can be potentially dangerous, since fishermen sometimes use pieces of chopped up fish as bait which often, at times, can inadvertently attract sharks. The nutrients in effluent and waste products, like sewage is not only unhealthy to swim near, but also attracts bait fish so sharks are more likely to be around such areas looking for food. Think like a shark. If you see lots of seals or fish the chances are that sharks could be around and could confuse you as their dinner! Keep cool in order to collect your thoughts in the few critical seconds that you have to make the right decisions. If you are not able to out swim out in open water stay still and get into a position where you are able to defend yourself. Use anything that you possibly can rather than your hands, like your surfboard or snorkel. If possible use the board as a barrier to defend yourself from the shark. If the shark gets close enough to touch, take any action that may disrupt its attack. Strike back, making sudden movements to strike its nose and aim at the most delicate areas of their eyes or gills. Clawing and gouging at its eyes is known to be effective. Some people have blown bubbles and kicked out with their legs. Sharks swimming slowly and smoothly are not generally a threat. They may approach divers but they are often just curious. If a shark begins making sudden movements, swimming quickly, or if it shows signs of irritation or aggression by pointing its fins down, arching its back, pointing its head upward, zig-zagging or charging, it may be deciding to attack. 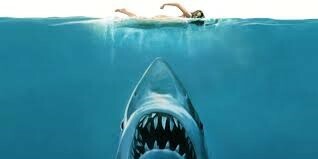 Swim quickly and smoothly to safety, always keeping an eye on the shark and preparing to defend yourself. 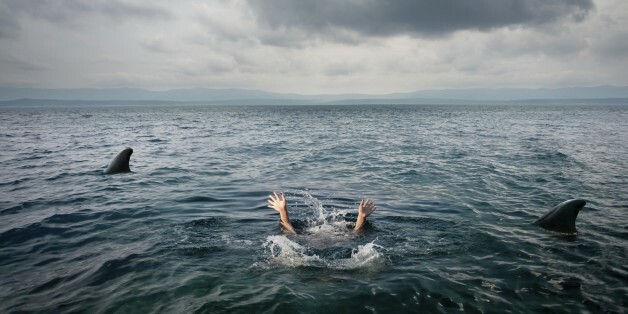 If it bites into you and drags you down underneath the water continue to be aggressive. Most shark fatalities happen from being bitten, then not getting to shore quick enough for help and to get to hospital. You will not be eaten whole, so do whatever it takes to go down fighting!